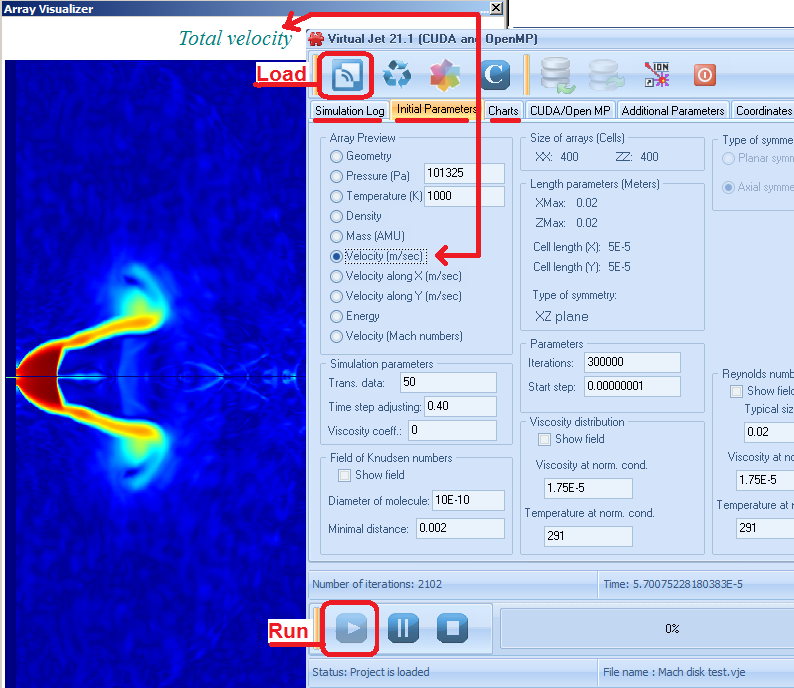 Here is a very brief demonstration of running Virtual Jet, which is a gas flow solver included in the Virtual Device v21.1 Demo. (1) Open Virtual Jet. This is located in the Window start menu: Koltran Labs CO > Virtual Device 21.1 - Demo > Virtual_ket_CUDA_OpenMP-Demo.exe. (2) Load the file "c:\Program Files (x86)\Koltran Labs (CO)\Virtual Device 21.1 - Demo\mach_disc_test\mach disk test.vje" from the "Load" button in the upper left of the Virtual Jet window. (3) Click the "Run" button on the lower-left the Virtual Jet Window. (4) For viewing, select "Velocity (m/sec)" from the "Array Preview" panel. Note: in the Array Visualizer window, you probably need to zoom out (by right clicking the mouse on the Array Visualizer window). You can examine the progress from the Log and Charts tabs. The "mach disk test.vje" is the Virtual Jet simulation file that you load and run in Virtual Jet. 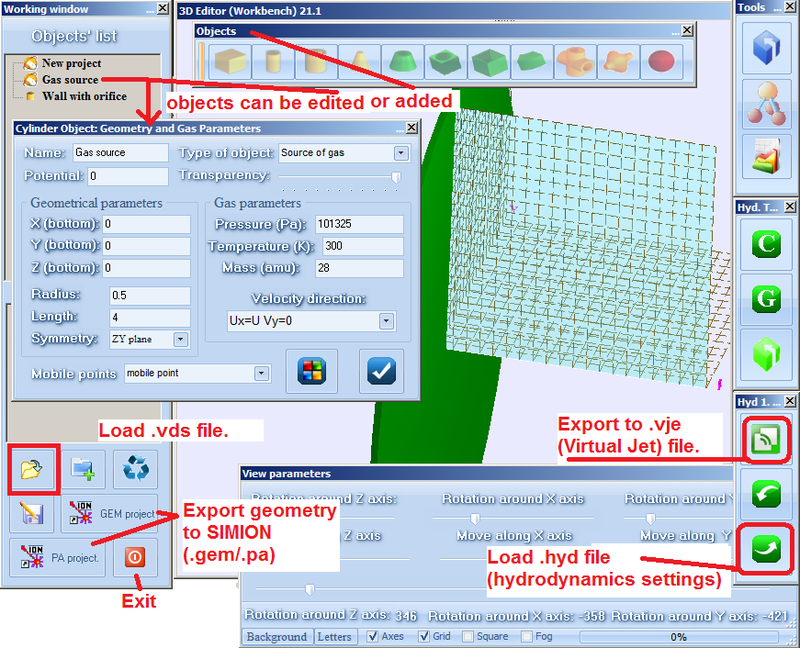 It was previously created for you in the Virtual Device 3D Editor program by loading both the "Mach disk test.vds" (virtual device simulation) file and "400x400.hyd" (hydrodynamics parameters) and then exporting to a .vje file. The .vds and .hyd provide the boundary conditions for the geometry and gas flow. The .vje file contains arrays that are solved subject to those boundary conditions. The .vds file can also (or alternately) provide the boundary conditions for electrostatic fields (by exporting to SIMION .GEM or .PA files). See the PDF manuals in the "help" subfolder of the Virtual Jet program folder for details on using the software. These manuals are fairly extensive though still somewhat rough and will be improved over time. Faster speed can be obtained with CUDA hardware. After stopping a Virtual Jet simulation, you currently must close and re-open the Virtual Jet program. If you terminate the Virtual Jet program in the middle of a calculation, the "RUN_DLL_OMP.exe" process will still be running in the background. Use Windows Task Manager to terminate this before starting a new simulation to avoid problems running.